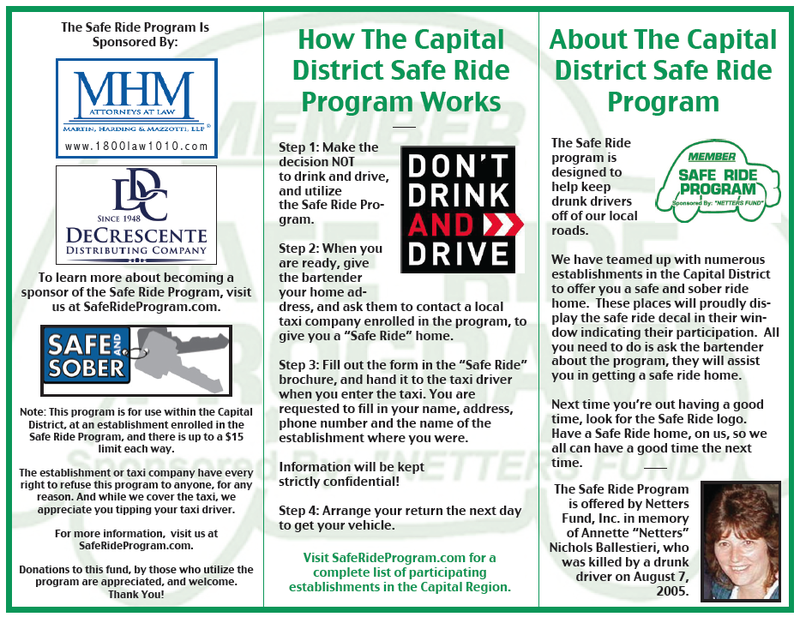 Capital District Safe Ride Program — A Program Of Netters Fund, Inc. The Safe Ride program is designed to help keep drunk drivers off of the roads. At Netters Fund, Inc. we are not against drinking, we are against drinking and then driving. If you have been drinking and need to go someplace do so with a sober ride, a safe ride! Click here to learn how the Safe Ride Program works. We have teamed up with numerous establishments in the Capital District to offer you a safe and sober ride home. These places will proudly display the safe ride decal in their window indicating their participation. All you need to do is ask the bartender about the program, they will assist you in getting a safe ride home. Next time you’re out having a good time, look for the Safe Ride logo. Have a Safe Ride home, on us, so we all can have a good time the next time. Note: This program is for use within the Capital District, at an establishment enrolled in the Safe Ride Program, and there is up to a $15 limit each way. The establishment or taxi company have every right to refuse this program to anyone, for any reason. Please do not abuse this program, as it is sponsored by the “Netter’s Fund, Inc.” which was established in memory of Annette “Netters” Nichols Balistreri, a very special person in our community. Any and all problems, please contact “Netter’s Fund, Inc.” through any of the contact information listed on this page.